In a world where oil is king, a burgeoning industry of renewable speciality chemicals derived from biomass waste is quietly, yet steadily, leading a revolution. Aside from fuels, oil is a building block for chemicals used to make plastic containers, fabrics, cosmetics, flavours and fragrances, solvents, detergents, adhesives, etc. In fact, 95% of all consumer products, including food and beverages, contain ingredients derived from crude oil. But while the amount of petroleum reserves remaining in the earth’s crust is disputed, what we do know is that oil is becoming more difficult and expensive to find and extract at a time when demand for it has never been higher. What happens when we reach the point where it is simply not viable to use petroleum and petroleum-based products? How will we create all the products we need to live and thrive? That is an issue that the biotechnology and chemical engineering industries have been studying for decades, successfully piloting innovative and revolutionary new technologies to curb our reliance on crude oil. Some of the most exciting work is taking place in the speciality chemical arena, where renewable and sustainable drop-in replacement chemicals are showing tremendous progress, application, and market viability. The amount of waste that humans generate, particularly biomass waste, continues to increase. Some sources say global waste generation is on track to double by 2025.1 Around the globe, though, companies are putting this waste to use, repurposing it as a food source for microbes in fermentation processes that lead to the production of natural and renewable chemicals. Waste streams from both agricultural and industrial processes can be used as feedstocks for fermentation and can include biomass such as fruit pomaces — the skins and seeds developed during juicing processes — spent coffee grounds, spent grains from breweries, agricultural waste water, etc. Not only will using organic waste biomass as a fermentation feedstock produce alternatives to petrochemicals, but it will also give new life to waste material that would otherwise go unused in landfills. Technology focusing on specialty chemicals, especially from waste biomass, has become a vital part of the chemical and food industries. Continued biotech and chemical engineering collaborations will no doubt result in additional innovations to convert fermentation outputs to replacement chemicals and, perhaps, a host of products heretofore unimagined. Polyculture fermentations, which consist of many different microorganisms, have distinct advantages over more traditional, pure culture methods that use just one species of bacteria or fungi. These advantages include the reduced necessity of intensive sterilisation processes, the ability to use lignocellulosic biomass waste streams from other industries as feedstock and, perhaps most importantly, the ability to produce a more diverse array of fermentation products. Strictly speaking, fermentation refers to an anaerobic metabolic pathway that occurs in microorganisms that involves the conversion of sugar or other organic molecules into acids, gases, and alcohols. A classic example of fermentation is the use of yeast to convert sugar into ethanol and CO2 during beer making. However, in the biotech industry, fermentation may refer to either aerobic or anaerobic culturing techniques. Although many typical fermentations used in biotech and the food industry involve pure cultures, polyculture fermentations offer a greater range of products. Polyculture fermentations are essentially the biotech equivalent of agricultural permaculture, which is the practice of applying patterns observed in natural ecosystems directly to agricultural practices. Like macro-ecosystems, microbial ecosystems consist of many community members making up a complex food web – each individual supplying a different individual with a required nutrient. Many microbial communities in nature are extremely diverse and, in fact, are more resilient and productive specifically because of their diversity. Thus, ‘permaculture fermentation’ involving many different microorganisms in the fermentation process results in a range of substrates that can be introduced into the fermentation process as feedstock, as well as a more varied collection of products. In general, anaerobic polyculture fermentation (Figure 1) consists of four basic steps: hydrolysis, acidogenesis, acetogenesis and methanogeneis. During hydrolysis, the complex organic polymers in the feedstock are broken down into simple, fermentable sugars. This requires the presence of (hemi)cellulose degrading organisms in the mixed culture. Acidogenic bacteria then metabolise the sugars, converting them into CO2, hydrogen, ammonia, organic acids, and trace amounts of hydrogen sulfide. Intermediate alcohols and aldehydes are also formed. Acetic acid bacteria then convert many of the organic acids into acetic acid. Acetic acid is ultimately metabolised by methanogens into methane and CO2. Figure 1. 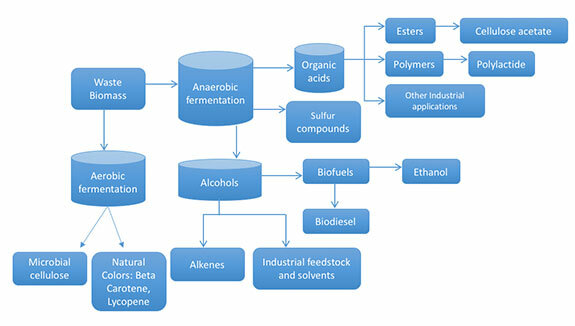 The general anaerobic fermentation process and compounds produced. General products from both aerobic and anaerobic fermentations include microbial cellulose, sulfur compounds, organic acids, and natural colours. In addition, anaerobic fermentation products can include propanediol, butanediol, propanol, esters, and various volatile sulfur compounds. Although some of these compounds can be directly extracted from the fermentation broth and be made ready for the market, other and more complex compounds can be generated by utilising these fermentation products as building blocks (Figure 2). Figure 2. A schematic displaying how waste biomass can be utilised in fermentations and a few of the natural products created during these fermentations. The products of fermentation can be manipulated by utilising different feedstocks or halting the fermentation during certain phases. Other fermentation pathways that can be implemented into the general flow described above include ethanol and glycerol fermentations carried out by yeast. 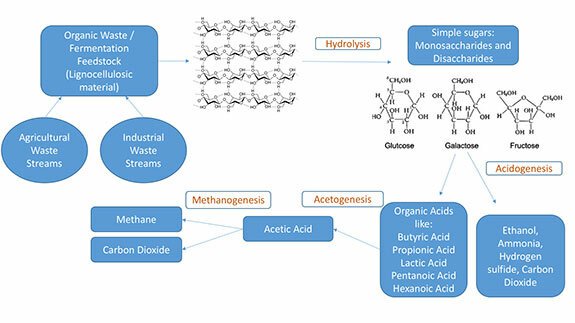 Additionally, homo and heterolactic acid fermentation by different lactic acid bacteria and mixed acid fermentations carried out by many enterobacteriaceae lead to the production of many different organic acids, including lactic acid, acetic acid, propionic acid, butyric acid, pentanoic acid, hexanoic acid, as well as hydrogen gas. Naturally derived fermentation products have the same practical applications as chemicals derived from petroleum, with the added benefit that they are fully renewable and sustainable. In many cases, these fermentation products generate the exact same compounds as petrochemicals and, in all cases, they provide organic, drop-in replacements that are marketable and reduce oil dependence. This articles outlines a few of the more common uses for fermentation products. The organic acids, sulfur compounds, cellulose, and alcohols obtained from fermentation are extracted and separated into individual components by several purification methods, including ion exchange, distillation and fractional distillation. The organic acids are then converted into esters, which have many applications. Fermentation products also have many potential applications in polymer synthesis. Cellulose has been conveniently converted to cellulose acetate by reacting it with acetic acid in the presence of sulfuric acid as a catalyst.2 Cellulose acetate, in turn, has many industrial applications, including films, membranes, and fibres. Acrolein and hydroxyacetone (acetol), important starting materials for many products, are obtained from glycerol using various catalysts. Acrolein is used as a biocide and as a chemical precursor for methionine, an essential amino acid. Acetol is particularly reactive due to the presence of the hydroxyl and carbonyl functional groups, hence it can promote a variety of reactions, including dehydration, polymerisation, hydrogenation and oxidation. Polylactide is a biodegradable aliphatic polyester from lactic acid via a polycondensation reaction catalysed by boric or sulfuric acids. Polylactide applications include packaging, drug delivery, textile, composites, tissue engineering, orthopaedics, sutures, and pharmaceuticals. Dehydration of alcohols obtained from fermenting biomass results in alkenes, which are starting materials in the manufacture of plastics, laquers, detergents and fuels. Ethene being the most important organic feedstock in the chemical industry, ‘green’ poly(ethene) is produced by dehydrating ethanol vapour in the presence of magnesium oxide, alumina, and silica at 325 – 480°C.3 Likewise, green propylene has been produced by propanol dehydration. New biochemical plants are emerging around the globe to process and accelerate production of renewable chemicals from fermentation. For example, Blue Marble Biomaterials’ AGATE (acid, gas, and ammonia targeted extraction) proprietary polyculture fermentation technology employs non-genetically modified microorganisms to produce the key building blocks for the chemical industry. Also, Italy’s Novamont opened a plant recently to produce bio-butanediol, which is used to manufacture biodegradable plastics. Other biochemical companies include JM-Rennovia (making glucaric acid from glucose), BioAmber (production of succinic acid by fermentation), Virdia Inc. (processing sugarcane waste), and Genomatica (producing butadiene from renewable feedstocks to be used for making more sustainable rubbers). Combining cutting-edge biotechnologies with chemical engineering, these specialty companies have successfully demonstrated both the viability of and interest in chemicals derived from biomass waste. In the years ahead, these chemicals will provide necessary alternatives to natural resource-based petrochemicals and bridge the financial gap as crude oil becomes more difficult and costly to extract. The unique capabilities of polyculture fermentations make it possible to generate drop-in replacement chemicals using a sustainable feed source. As the global human population continues to grow and place ever more demands on natural resources, renewable products, including speciality chemicals and biodegradable polymers, will offer significant opportunities for companies and entrepreneurs investing in green technologies. HOORNWEG, D., and BHADA-TATA, P., 'What a Waste: A Global Review of Solid Waste Management', p. 8, (2012). Industrial and Engineering Chemistry 1946, 38 (1), pp. 77 – 82. 'Applied Catalysis A: General Volume 514', pp. 192 – 202, (25 March 2016).